Above: from a Saskatchewan Education brochure circa 1981. By late October 1980, community involvement in running the community schools was remained a key sticking point. A letter to the Connaught Parents’ Group from the provincial Minister of Education, advising that program go ahead as planned and difficulties be worked out as it grew, didn’t seem to help; the Connaught-area groups were determined that the agreement be acceptable from the moment they signed it. 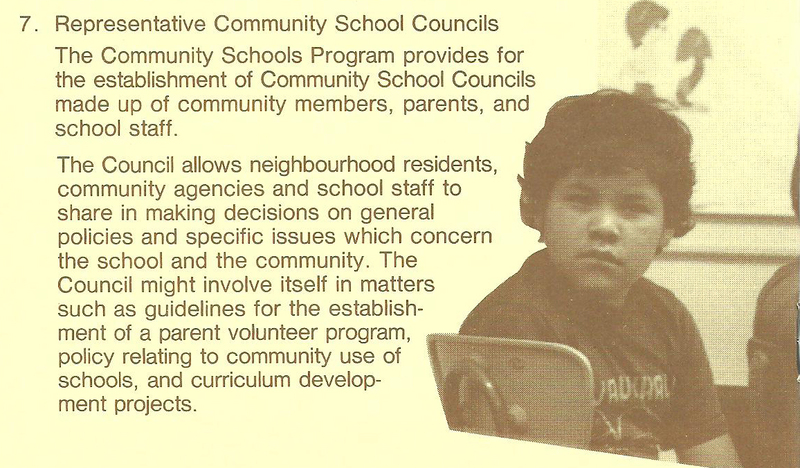 By this point, of the six Saskatchewan school boards chosen to take part in the 1980 community school program, Regina Public was the only one that hadn’t signed an agreement. The community groups concerned had worked too hard, she wrote, to see the community school program “unwittingly destroyed by uninformed decisions in some comfortable boardroom,” made by out-of-touch Trustees who “have not done (their) homework” and were barely familiar with the program. Fortunately, the deadlock between the working group and Board of Education did not last much longer. A workable compromise was finally reached and, on November 10, the Community School Program Agreement was formally signed by the Board and the Department of education. Connaught became a community school in time for the spring semester, a change that included the hiring of a Community School Coordinator and four Native Teaching Associates. The next year, the first community school council – made up of six Connaught parents and three local residents – was elected to oversee the program. Although many struggles lay ahead, the foundation of community schooling had been placed on solid ground. Among other things, the SCC’s constitution stated at least three of nine council seats would be reserved for First Nations and Métis parents. As well, the SCC would have input into placing teachers at the school. “We sat on hiring panels and also had influence over who the principal would be. This is what community control means,” Asikinack says. SCC members poured a new concrete floor in the basement and painted the walls, creating the school’s Community Room, for which they had their own set of keys and unlimited access. When the room was ready, they invited school trustees to a breakfast meeting. “We arrived early and took the good chairs, so that they would be relegated to the rickety chairs. Soon after, we got new chairs,” laughs Asikinack. Along with the teaching associates, a new staff position called the community coordinator was to be a cornerstone of the emerging program. The coordinator’s work involved connecting with families and community members and involving them in the life of the school.